Indian American Kulkarni, a former US diplomat, is trying to unseat Pete Olsen in Texas 22nd congressional district. Indian American Democrat Sri Kulkarni, who is trying to oust incumbent Rep. Pete Olsen in Texas’ 22nd congressional district, has received a helping hand from an ex-colleague at Foggy Bottom, former US Ambassador to India Richard Verma. Verma, the first and only Indian American who served as a US ambassador in India, Wednesday sent out an email on behalf of Kulkarni requesting campaign donation and help to elect the Texan. The 22nd district, which includes several Houston suburbs, has the largest Indian American population in the state. A quarter of the district’s population is Hispanic and Asian Americans comprise 18 percent. If he wins, Kulkarni will become the first Indian American congressman from Texas. 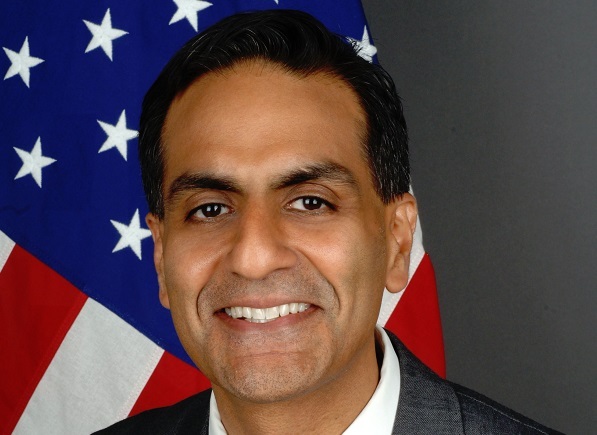 Verma served as US ambassador to India from 2014 to 2017. He is currently a vice chairman and partner at The Asia Group, which provides strategic and business advisory services to companies and organizations working in Asia. I want to tell you about my friend, Sri Kulkarni. Sri and I both served at the State Department together when I was the U.S. Ambassador to India — Sri is a proven leader who has served his family, community, and country for his entire life. Sri represented America for 14 years as a Foreign Service Officer with overseas tours in Iraq, Israel, Russia, Taiwan and Jamaica. He then served as a foreign policy and defense advisor on Capitol Hill assisting Senator Kirsten Gillibrand on the Senate Armed Services Committee. Sri has spent his career fighting to ensure that American values are represented in our foreign policy. Now, he’s returned to Texas to fight for them here at home. Today more than ever, we need leaders like Sri who will champion diplomatic solutions and put country over politics. Make a contribution of $25, $50 or $100 right now to help Sri share his message with voters in TX-22 and bring his diplomatic experience to Congress. Sri isn’t just talking about our values: he’s acting on them right now. His team is committed to expanding voter turnout in their district and has volunteers reaching out to people in over a dozen languages. He is committed to making sure that everyone’s voice is heard in our democracy. But with only 48 days left until the election, we’re running out of time to make sure everyone in Sri’s district hears his message. Make a contribution of $25, $50, $100 or whatever you can, and let’s help Sri fight for our values in Congress. Heartiest congrats to Mr. Salim Shah of Hingez Therapeutics for obtaining substantial grant from NIH to develop drug which is praiseworthy. Hard work, dedication and passion pays off.